NH 48 bisects the city. The western part was the original location of the town, while the eastern part consists mainly of industry and newer residential areas. 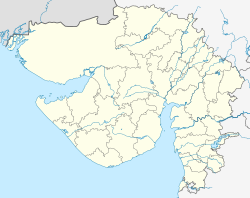 Mumbai is roughly 180 km to the south, and Surat is about 120 km to the north. Surrounding locations include Daman, Dadra and Nagar Haveli, Umbergaon, Sarigam, Bhilad, Udvada, Sanjan and Pardi. Both the Union territories (Daman and Dadra and Nagar Haveli) as well as Sarigam, Bhilad, Umbergaon, and Pardi, only 12–40 km from Vapi, are good residential and commercial areas. Daman and Silvassa attract tourists from all over the world. National Highway 8 passes through Vapi. It is connected to all major cities. It is the only place from which one can visit Daman and Silvassa. City bus service is available. To cater to industry, the city hosts what is called a "floating population". The Vapi railway station on the Mumbai-Vadodara rail link of Western Railway (India) has become the direct beneficiary in terms of revenues due to daily commuters. It is the only city connecting two union territories, i.e. Daman and Dadra-nagar haveli. Its proximity to Mumbai and Surat and its location on the busy NH08 highway has now made vapi a major transport hub. A coast guard airport is running in daman where private charters can operate with prior permissions. Chemical industries such as Vertellus Specialty Materials Ltd, Aarti Industires Ltd, Supreet Chemicals, and textile giants such as Alok industries, Welspun Terry Towels, Century Textiles, GHCL and Raymonds Limited have strong presences in Vapi and nearby areas. Bayer Vapi Pvt Ltd,United Phosphorus Ltd., Supreet Chemicals Pvt Ltd., Sarna Chemicals, Sangir Plastics, Kampun Polymers, Lathia Rubbers, Aarti Industries Ltd., Themis Industries and Hubergroup India Pvt Ltd (formerly Micro Inks Limited), Unique Star Alliance Tools Mfg. Pvt. Ltd. operate manufacturing plants in Vapi. Today, about 70% of the total industries in the township are chemical plants, mainly for chemical distillation and the production of pesticides, dyes, dye intermediaries and paints. Other major industries include paper, packaging, pharmaceuticals, plastics, rubber, textiles, wood, computer hardware and software, engineering workshops, glass, and food products. Another striking feature of Vapi is the Common Effluent Treatment Plant (or CETP). This is the largest of its kind in Asia and one of India's biggest effluent treatment plants in terms of capacity, treating the pollutants from these industries before the effluent is released into the river. The CETP is run by Vapi Waste and Effluent Management Company, promoted by the Vapi Industries Association. Vapi has the maximum number of Kraft paper & duplex board paper mills in India. The best quality paper producers are located in Vapi and to have more than 20 kraft paper mills within a distance of 20 km. Therefore, Vapi is also known as "paper hub". ^ "Vapi City Population Census 2011 | Gujarat". www.census2011.co.in. Retrieved 23 October 2017. ^ "'Vapi most polluted industrial cluster again' - The Times of India". Timesofindia.indiatimes.com. 20 May 2012. Retrieved 17 July 2014.